I don’t even know where to start when it comes to Jakarta’s roads. Is it bad? Horrible? A nightmare? They are probably the kind of roads that you can find in the deepest bowels of hell. Perhaps, my extreme resentment towards Jakarta’s road stems from the fact that I still missed my flight even though I left for the airport 3 hours early. Anyway, Government statistics revealed that the average traveling speed is approximately 8 kilometers per hour – that is equivalent to a very, very light jog. 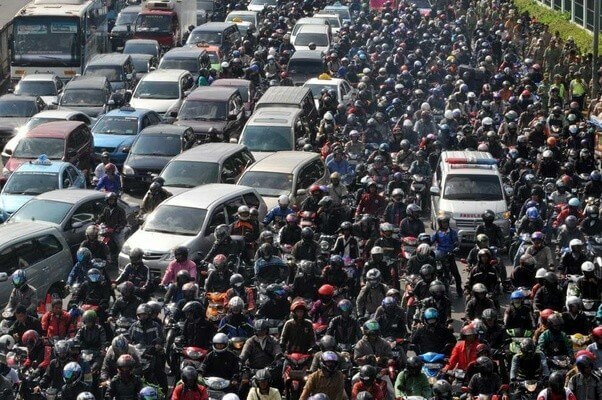 According to Castrol’s Magnatec Stop-Start Index, Jakarta reported the most number of traffic jams on Earth, with a whopping 33,240 stop-starts annually. This won Jakarta the titled of World’s Worst Traffic Jam. Truly a class act. This has led to vendors hawking snacks and drinks to very unhappy commuters in the gridlock. Clearly, Jakarta officials were not ready for the extremely rapid expansion of the city – census data indicates the city to be home to over 9.5 million people, exceeding the official 2025 population prediction of 9.3 million, made by the Government’s Central Statistics Agency in 2005. As frightening as it may sound, this is just the tip of the iceberg. Inhabitants in Jakarta are also buying new vehicles faster than the city is able to develop its infrastructure. Back in 2010, then president Susilo Bambang Yudhoyono conducted a study which found that 474 new cars and 2,946 motorbikes join Jakarta’s traffic jams each day. The city is estimated to lose US$3 billion a year from the massive gridlock and traffic congestion. Another issue that has cropped up from Jakarta’s rapid urbanization is flooding. In 2007, the worst floods inundated about 70% of Jakarta, killing at least 57 people and making 450,000 homeless. In 2015, floods inundated many parts of Jakarta, causing an estimated loss of $234 million. In August 2016, eight sub-districts in South and East Jakarta were flooded, affecting 10,538 households. 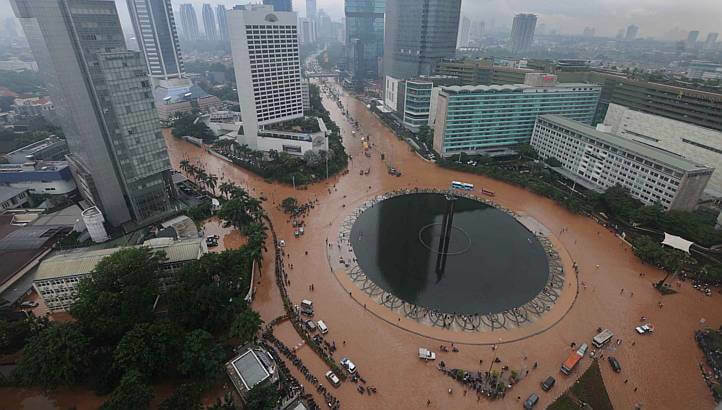 The annual flooding in Jakarta is evident of the rapid urbanization in Jakarta. Traffic congestion and flooding are just two of the urbanization issues plaguing Jakarta, and they have left the city in a rut. I can only imagine what would happen if other adverse impacts on urbanization worsen. It is therefore, of paramount importance for these issues to at least be alleviated, if not solved. How can IoT fix these seemingly irreversible problems? Big Data. While it is difficult to control the population growth (unless of course there is a concerted effort to decentralize), the new citizens in Jakarta are also generating unprecedented amounts of data that can give valuable insights to city councils and governments to cope with the urbanization challenges. The possibility to collect and analyze real-time, raw data across a wide variety of city services and operations will definitely change city life. All the new data sources are enabling new innovations, applications and services, changing the way that citizens interact with the city government, built environment, and one another. Devices embedded with sensors can be attached to cars and other relevant devices and machines, which then capture data such as - amount of time a car is stuck in the traffic for, the average speed that the car is moving on road, the timing which causes the most congestion, the start-stop time for a car etc. The data generated from these will be able to inform city policy-makers to deploy tactics and strategies (maybe more technological tools) to not only alleviate existing problems, but also enhance quality of life. Big data is all the rage now, and it should be. 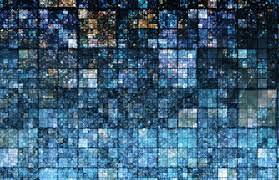 Data is knowledge and knowledge is important in diagnosing and solving longstanding issues that are difficult to address before the digital revolution. Big data analytics companies should look forward to the burgeoning region of ASEAN. While there are more than enough urban problems at hand, there is also more than enough data to quench their thirst for it; even more so with enterprises and public service organizations are actively looking at ways to improve their businesses and operations, with one being to leverage data. Having said that, city councils should always work towards improving public infrastructure because no amount of data can improve city life without better infrastructure. We will be having lots of city councils represented at our upcoming Asia IoT Business Platform series in Thailand, Malaysia, Philippines, and Indonesia. If you are ken in meeting them to introduce your big data analytics solutions and services, drop me a note at zaidani@industry-platform.com.